I’m telling my stories all out of order again, so to preface this I must say that I quit my job 10 days ago. In those 10 days, I’ve struggled with many things, including the feeling that I must be busy 24/7 to make up for the fact that I’m not working. Yesterday I had a huge list of things I could be doing. I even did some of them. However, one particular thing I didn’t do made me feel like a failure, and as I journaled about it I kept pulling out more and more failures from my day. I failed to make a dentist appointment. I failed to apply for a new job. I failed to do any exercises in any of my three self-help workbooks. I failed to comment on any blogs, upload any photos, or add any information to my family tree. Today, my therapist questioned why I did not do a thought diary (an exercise from CBT) regarding these thoughts of being a failure. Oh, look, I failed again! 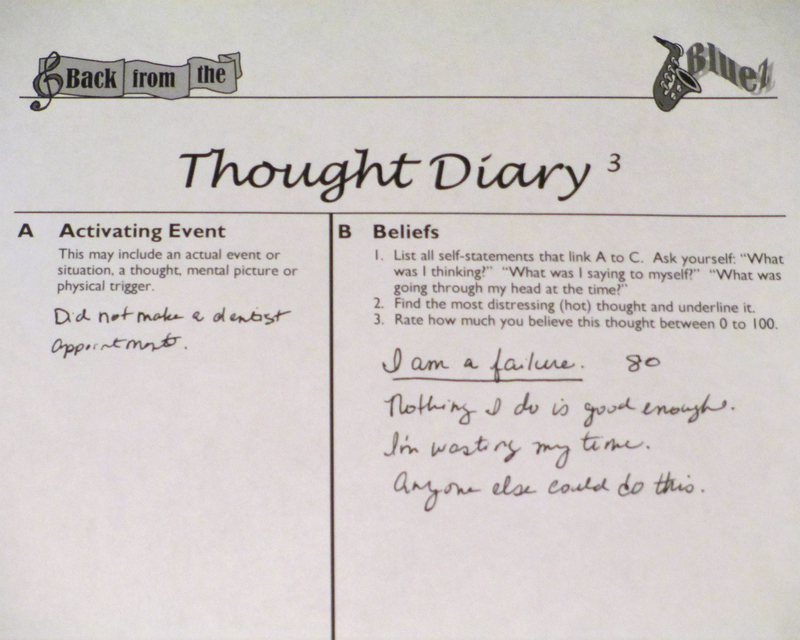 In fact, I have failed repeatedly, as I quit doing thought diaries within a few weeks of her teaching them to me. I felt guilty as I explained that they are difficult. I let her think it was strictly about the amount of work, but they are emotionally difficult as well. As we moved on to disputing my “hot thought” of “I am a failure.”, I listed all the things I didn’t do yesterday as evidence of this “fact”. When providing evidence against the hot thought, my therapist asked me to think more broadly about my past accomplishments. So while I included “I did write a blog post.” and “I made other phone calls that day.” as accomplishments from yesterday, I also came up with a few from the past. I wrote a play. I designed a style for a website. I’ve been in a few plays. Then she asked me to think about ways in which others have complimented me. She mentioned that some people from my ex-job had probably told me I did well at things. She was right. I used to work with people from a department outside my own, and they frequently lamented the days when I was working on other tasks or was unable to attend work. They told me how well I did at the job. I’ve left a couple of our pieces of evidence out of the previous two paragraphs, because the act of doing the thought diary actually brought up two additional negative beliefs. The first was that scores on standardized tests are not an accomplishment because they are just numbers that no one cares about (disqualifying the positive). The second was that any positive comments made by my mother don’t count, because she feels obligated to compliment me (jumping to conclusions). This proved my therapist’s point that I need to be doing these thought diaries regularly or I will never stop having negative thoughts that stir up negative emotions. After the evidence for and against the hot thought, the next step is to answer one or more disputation questions designed to bring up positive alternatives to the negative thought. I chose to answer “How might someone else view the situation?” My therapist said, “What would Wendy* say?” *(former therapist, not her real name) I really hate it when she uses Wendy against me. It just stirs up the pain of her having finished her internship and left, and even worse I feel like my therapist’s subtext in these moments is that the two of us still haven’t built a rapport. I’m doing the best I can. I wish she knew how much I like her and want to feel comfortable with her. How much I beat myself up internally every time I sit in her office and deflect pain with humor. I would give anything to show sadness or anger in front of her, to prove that I’m more than a really bad comedy act. So now I feel like I need to do a thought diary about doing this thought diary. Therapy is becoming entirely too meta.